No family members were skateboarding, but the activity occurred in front of their house. The homeowners association said pay $300 or get out. Unhappy with the demand, she asked for a hearing. "There was no discussion...they just went through the motions," said Castrogiovanni of the meeting. "One board member said if we didn't like it we should move." not paid the fine. They recently received a certified letter saying a lien would be placed against their home if payment isn't made. $50 for each of the two instances they were cited for. But $50 for each child, none of whom were theirs, is "a bit excessive," said Castrogiovanni. Skateboards, in-line skates and scooters are not permitted in the street in the Fieldstone development, a 184-townhouse community off Sugan Road. Originally violators were fined $10, said residents, but that was raised to a maximum of $50 for each offender. Dani Castrogiovanni and others said they believe the board has always issued the maximum penalty. No warning letters preceded the notice of her fine, she said. "They could have used a more personal approach...a more neighborly approach," she said. In the Castrogiovannis' case, a total of six teens were seen on two separate occasions in the street near their home on Fieldstone Drive. In neither instance was their grandson - who, Dani said, prefers bicycles to skateboards - one of the offenders. But they were his friends, and therefore the family's guests, the Castrogiovannis were told at the hearing. It was their responsibility to pay the fines. Although two of the teens observed at the Castrogiovannis' home live in the development, she and her husband were fined, not the teen's parents. The community's property manager, Bill Baker, said the board had no comment on the matter. John Snodgrass, who has paid his share of fines for his son skateboarding in the street, said he's tried to fight the ban but couldn't win. "The streets are privately owned," said Snodgrass. "It's the law." He said an attorney told him it would cost him about $3,000 to challenge the restriction and there was no guarantee he would win. "It's a shame. The kids have nowhere to go. They don't hurt anything. They don't damage anything," said Snodgrass. "They're preventing children from enjoying this community. Children are being deprived of a safe place to play," he added. Although association rules don't prevent youngsters from using the sidewalks or driveways, Snodgrass said the streets are actually safer because they're smoother and there's very little traffic in the neighborhood where many residents are retired. "I'm suspicious there's an anti-child sentiment" at work, said Marc Rickles whose son Ben lived in Fieldstone and still visits there. Rickles, a trial attorney based in Newtown, said the five-member homeowners association board "have become policemen" and have misinformed residents about their liability if someone is hurt in the street. "This community has every right to curtail certain activities, but they should do it for the right reasons and do it honestly," said Rickles. He said it is not true that a homeowner or the association could be held responsible if a child is injured skateboarding in the street. 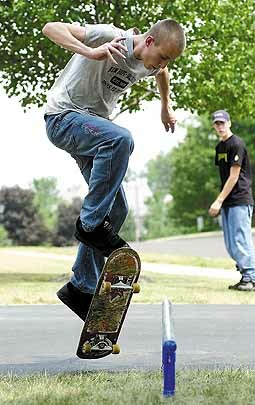 In a letter to the board last summer, Rickles proposed limiting skateboarding, in-line skating and scooters to certain hours. He suggested the board require riders to be courteous, yield to cars and wear helmets, but he never got a response. "It's really gotten out of hand," Rickles said. "This is just about being fair."